Conic Design begins with the premise that humans were never intended to live in cubes. Rather, every surface that nature creates, from the walls of the womb, to the bending canopy of trees and the graceful unfolding of leaves and flowers, all speak of curves in beautiful arching patterns. Curves are our natural habitat. 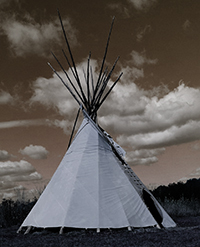 From the rounded interiors of stone caves to the teepees of the North American plains, primitive man gravitated to curved structures as a natural expression of his belonging to the world into which he was born. Our aim is to return to the natural beauty and harmony of curved architecture. 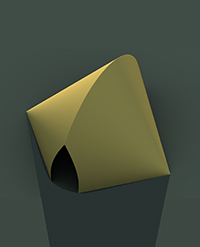 Conic designs utilize the magic of flat surfaces that can be bent or folded into curved configurations to create super-strong, livable homes and human habitats of unlimited variation. The above 1850 sq. ft. design has many livable common and private rooms, exterior and interior vertical walls, sliding glass doors and other architectural amenities found in conventional residential homes. In this example, the roof is a 2" thick reinforced "thin shell" concrete that is much stronger and earthquake resistant than conventional wood frame construction. 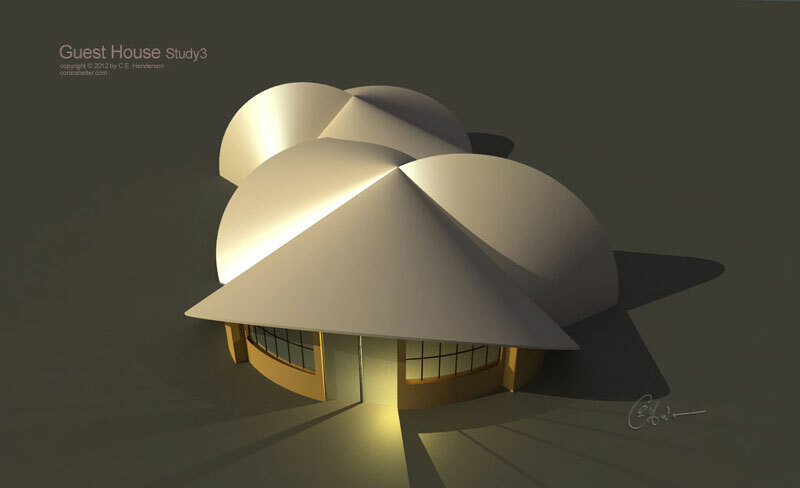 Conics can be very competitive with conventional architecture because they use less materials and can be constructucted quickly. Click here to listen the KGUA radio interview with inventor Chuck Henderson by Peggy Berryhill. Recorded on 3/13/2012 this 20 minute interview gives an overview of Conic architecture and its 38 year history. The refugeConic - 250 sq. ft. minimal structure made entirely of 1/2 plywood. No rafters or internal supports. Plans available - Click Here. 1050 Square Foot freestanding workshop assembled in 8 days with 3 man crew.. Composed entirely of 4x4 foot plywood panels. Unlimited square footage and non-supporting window walls are possible with Conics. 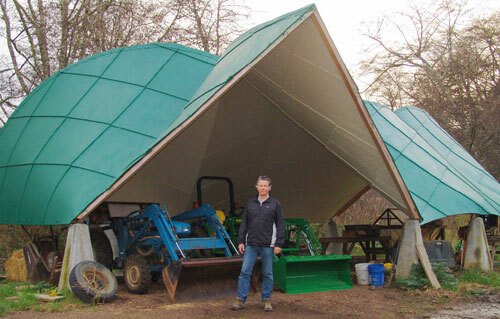 Outbuildings for farm equipment and shop space are very economical with Conics. Pictured above is the Oz Farm Conic built in 2009. Inventor Chuck Henderson is standing in front of the two main tractors parked in the Conic in winter lockdown. In spring the Conic serves as the main food processing and packaging facility. A 31 unit conic village proposed as a solution to refugee and homeless issues. 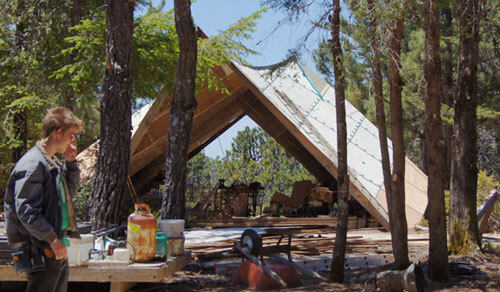 Conics inward sloping roof and wall designs complement the natural inverted cone shape of trees creating an environment that complements natural landscapes as well as the needs of the indigent. Preliminary structural analysis shows the unique characteristics of the Conic form. 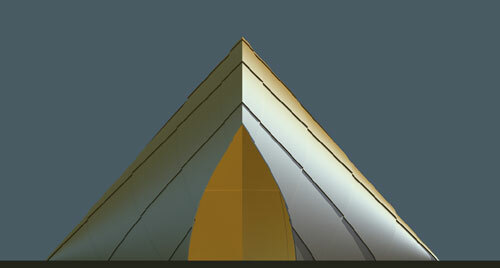 The above 80' x 40' multiConic was computer modeled and analyzed using state-of-the-art finite element software. Although the structure weighed 80 tons it was shown to support 13,000 tons before collapsing (a 1/165 weight to strength ratio!). "Our goal is to create minimal structures with maximum structural integrity in all loading configurations - hurricane, earthquake, snow, even tornado" - Chuck Henderson Inventor. Conics are a thin-shell architectural form built from thin materials like plywood or reinforced ferro-cement type concrete. Conics are a minimal, extremely cost effective, and highly versatile architectural form that relies on geometric curved configurations and material flexibility for superior strength. 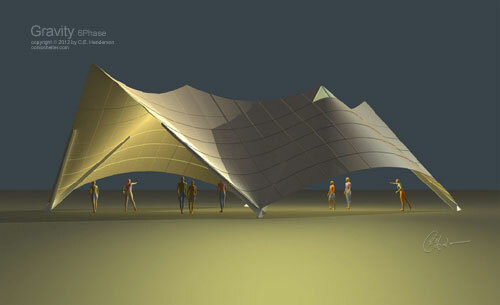 Assembled very quickly, Conics can be used as a residence, open-air shelter, shop, or office space. Multiple exterior, insulation and interior finish options are available. 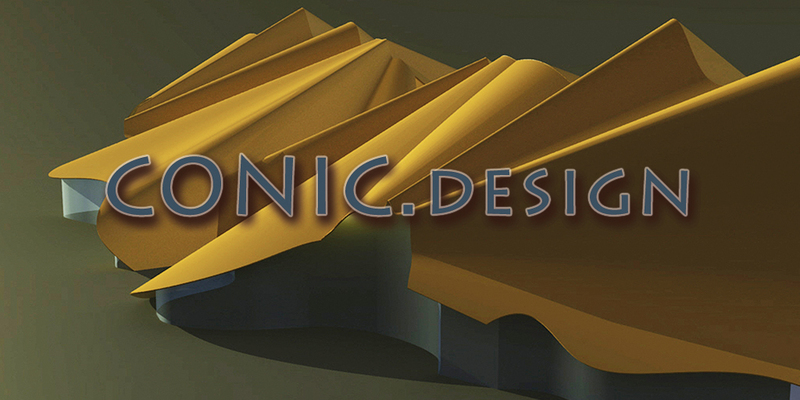 For more contact info@conic.design, or call us at 707 884 1769. Conics can be scaled to any size and can be designed in an infinite variety of configurations to create amazing architectural expressions. 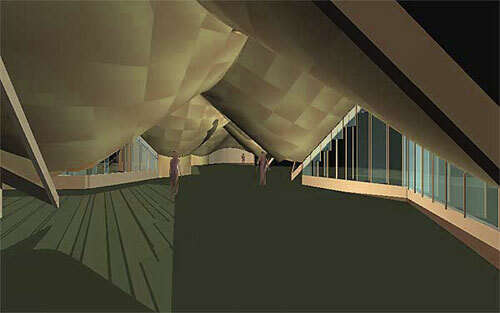 Vertical walls can be dropped from the Conic roof forms to create completely enclosed spaces. 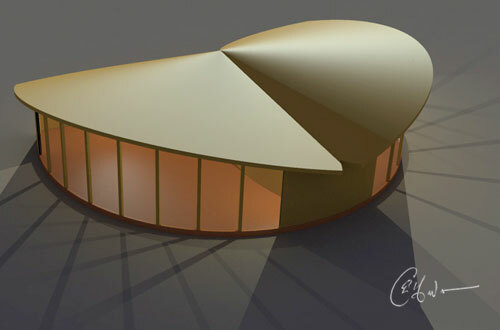 Conics can be easily integrated with solar and other green technologies to create complete structures for any use. 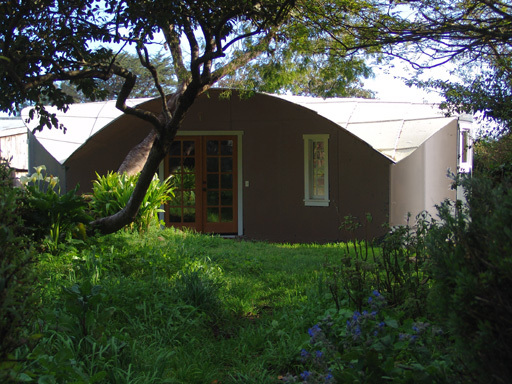 Conics can be constructed in large frame configurations like the geodesic multiConic shown above or as small cozy cottage forms like the 500 sq. ft. home shown below. As Built. This 500 sq. ft. residence is built with no rafters or stud walls. The curve shape of the Conic provides all the structure. This Conic is built on grade with a surrounding french drain system. There is no step up or down to enter the structure - a great feature for older folks! Two Visica Conics joined together. This basalt-reinforced cement structure provides a 1000 sq. ft. interior space suitable for residence or studio. The thin shell curvature and super-strong reinforced structure can support a sod roof for xerobic landscaping or gardening. Conics can be fitted with opening acrylic skylights like the one picture above. Viewed from inside the skylight looks like a Jules Verne science fiction novel. All parts and fittings are stainless steel. 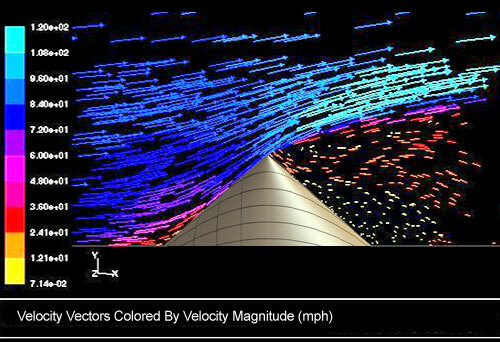 The computer wind analysis above shows a 100 mph wind flowing up and over a Conic shell. The result is a net downward pressure on all points along the surface during high wind events. We suspect this is why mountains migrate to the multiConic geometry... it's because this geometry has outlasted millions of years of high winds. Ridge Conic (Above Anchor Bay... California) Slide Show. 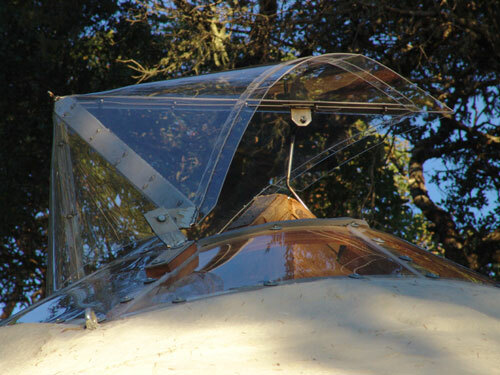 This was the first Conic built using a "fabrication-during-assembly" technique. 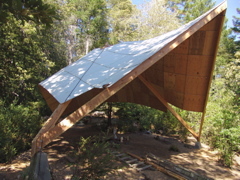 Panels were attached together while the entire structure was being hoisted by a crane (gin-pole technique). This allowed workers to assemble the panels at, or near, ground level, speeding assembly and making the workplace safer. Click here to View. What are Conics? And how can they be used to provide permanent, low-cost shelter for homes, offices, outbuildings, meeting spaces, and other uses?? Click Here to find out more. 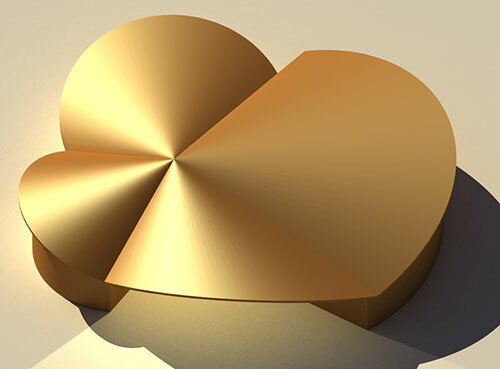 How To Get Involved With Conic Design. Are you ready to experiment with this new form of architecture? There are many ways to participate in the exploration of the "multi-conic" structural geometry. Click Here to find out more. Advanced Discussion 01. The multi-conic skin should theoritically be able to support itself without the need for internal tripod structures that extend all the way from the ground to the apex. Computer models reveal what a modified tripod ("generator") structure would look like. Click here for more. (Added 9/21/07). Click Here to find out more. How Does Nature Use Conics? The oldest geometric forms on the surface of the earth are ancient mountain ranges. Examining the geometry of these ancient forms shaped by wind, rain, snow, sun, heat and cold reveals forms that in many cases duplicate the multi-conic geometry. Is there a connection between the geometry and reported effects of the Great Cheops Pyramid of Egypt and multi-Conic geometry? The angular geometry is very similar. Click Here to find out more.